Plants lose water through their leaves and it's called transpiration. People lose water off their skin and it's called evaporation or sweating. When a plant stops losing water and when people cant produce enough sweat to cool off, both overheat. The weather influences that drive this water loss - water that needs to be replaced or the bodies begin to go into heat stress - are the amount of light (day length, cloud cover), relative humidity (it dries faster when air is dry and slower when humid - think desert versus Florida), and windy (more wind, more drying). Temperature is important, but not as much as these other drivers. Think freeze-drying - a very successful process for removing water from food. Often humans respond more to temperature than these other factors and figure, when it's cool. it's not necessary to water their plants, themselves or their workers. When employees work in hot conditions, employers must take special precautions in order to prevent heat illness. Heat illness can progress to heat stroke and be fatal, especially when emergency treatment is delayed. An effective approach to heat illness is vital to protecting the lives of California workers. California law requires employers to identify and evaluate workplace hazards and take the steps necessary to address them. The risk of heat illness can be significantly reduced by consistently following just a few simple steps. Employers of outdoor workers at temporary work locations must be particularly alert and also plan for providing first aid and emergency medical services should they become necessary. All workers should be accounted for during and at the end of the work shift. Heat illness results from a combination of factors including environmental temperature and humidity, direct radiant heat from the sun or other sources, air speed, and workload. Personal factors, such as age, weight, level of fitness, medical condition, use of medications and alcohol, and acclimatization effect how well the body deals with excess heat. 1. Recognize the Hazard. There is no absolute cut-off below which work in heat is not a risk. With heavy work at high relative humidity or if workers are wearing protective clothing, even work at 70oF can present a risk. In the relative humidity levels often found in hot areas of California (20 to 40 percent) employers need to take some actions to effectively reduce heat illness risk when temperatures approach 80 F. At temperatures above 90 F, especially with heavy work, heat risk reduction needs to be a major concern. 2. Water. There must be an adequate supply of clean, cool, potable water. Employees who are working in the heat need to drink 3-4 glasses of water per hour, including at the start of the shift, in order to replace the water lost to sweat. For an eight-hour day this means employers must provide two or more gallons per person. Thirst is an unreliable indicator of dehydration. Employees often need ongoing encouragement to consume adequate fluids, especially when the workload or process does not encourage breaks. 3. Shade. The direct heat of the sun can add as much as 15 degrees to the heat index. If possible, work should be performed in the shade. If not, employers where possible, should provide a shaded area for breaks and when employees need relief from the sun. Wide brimmed hats can also decrease the impact of direct heat. Acclimatization. People need time for their bodies to adjust to working in heat. This “acclimatization” is particularly important for employees returning to work after (1) a prolonged absence, (2) recent illness, or (3) recently moving from a cool to a hot climate. For heavy work under very hot conditions, a period of 4 to 10 days of progressively increasing work time starting with about 2 hours work per day under the working conditions is recommended. For less severe conditions at least the first 2 or 3 days of work in the heat should be limited to 2 to 4 hours. Monitor employees closely for signs and symptoms of heat illness, particularly when they have not been working in heat for the last few days, and when a heat wave occurs. Rest Breaks. Rest breaks are important to reduce internal heat load and provide time for cooling. Heat illness occurs due to a combination of environmental and internal heat that cannot be adequately dissipated. Breaks should be taken in cooler, shaded areas. Rest breaks also provide an opportunity to drink water. Prompt Medical Attention. Recognizing the symptoms of heat illness and providing an effective response requires promptly acting on early warning signs. Common early symptoms and signs of heat illness include headache, muscle cramps, and unusual fatigue. However, progression to more serious illness can be rapid and can include unusual behavior, nausea/vomiting, weakness, rapid pulse excessive sweating or hot dry skin, seizures, and fainting or loss of consciousness. Any of these symptoms require immediate attention. Even the initial symptoms may indicate serious heat exposure. If medical personnel are not immediately available on-site, and you suspect severe heat illness, you must call 911. Regardless of the worker's protests, no employee with any of the symptoms of possible serious heat illness noted above should be sent home or left unattended without medical assessment and authorization. The need to drink approximately one quart per hour of water to replace fluids. How to contact emergency services, and how to effectively report the work location to 911. 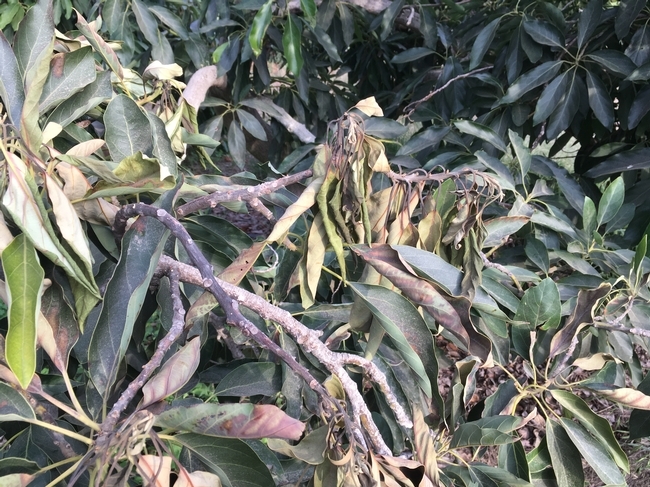 Photo: Heat Stress to avocado leaves. Ready! Set! Split! Navel Orange Time. These are hard days for navel oranges. Drought stress. Salt stress due to drought. Then a heat wave in July that messed the trees up. And now we head into a weird fall with maybe rain. Maybe no rain. Maybe a little rain. This is ripe for navel splitting. This time of year when they are starting to build sugar, they are also ripe for splitting. 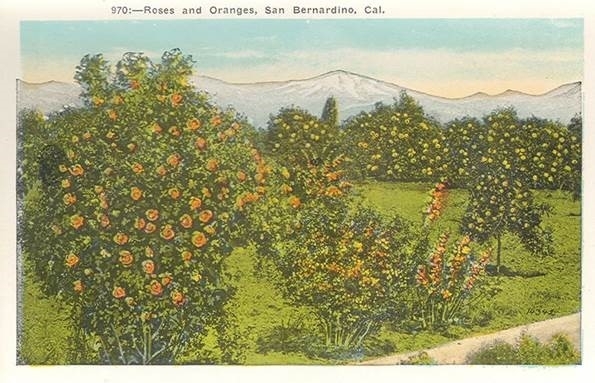 Years of drought, and a stressed tree are a perfect set up for navel oranges and fruit splitting. The days have turned cooler and suddenly out of nowhere there is rain. That wonderful stuff comes down and all seems right with the world, but then you notice the navel fruit are splitting. Rats! No, a dehydrated fruit that has taken on more water than its skin can take in and the fruit splits. This is called an abiotic disease. Not really a disease but a problem brought on by environmental conditions. Fruit splitting is a long-standing problem in most areas where navel oranges are grown. In some years, the number of split fruit is high; in other years it is low. Splitting in navel oranges usually occurs on green fruit between September and November. 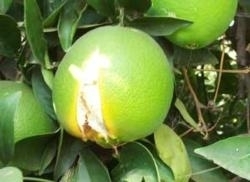 In some years, splitting may also occur in Valencia oranges but it is less of a problem than in navel oranges. Several factors contribute to fruit splitting. 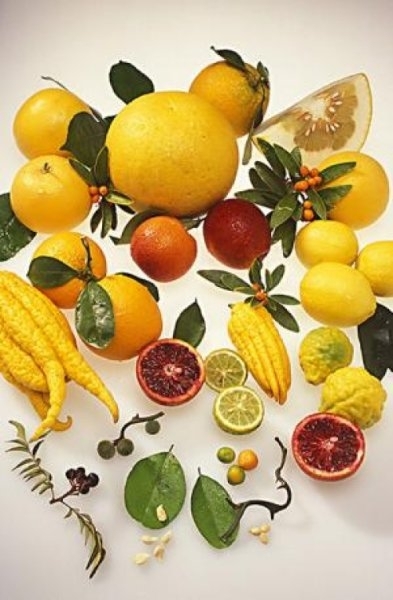 Studies indicate that changes in weather including temperature, relative humidity and wind may have more effect on fruit splitting than anything else. The amount of water in a citrus tree changes due to weather conditions and this causes the fruit to shrink and swell as water is lost or gained. If the water content changes too much or too rapidly the rind may split. In navel oranges the split usually occurs near the navel, which is a weak point in the rind. 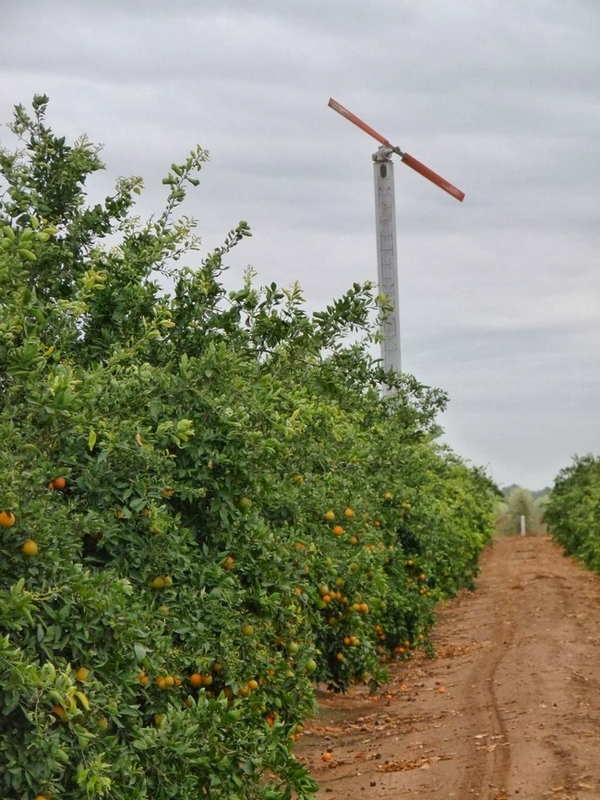 Proper irrigation and other cultural practices can help reduce fruit splitting. Maintaining adequate but not excessive soil moisture is very important. A large area of soil around a tree should be watered since roots normally grow somewhat beyond the edge of the canopy. Wet the soil to a depth of at least 2 feet then allow it to become somewhat dry in the top few inches before irrigating again. Applying a layer of coarse organic mulch under a tree beginning at least a foot from the trunk can help conserve soil moisture and encourage feeder roots to grow closer to the surface. If trees are fertilized, apply the correct amount of plant food and water thoroughly after it is applied. If the soil is dry, first irrigate, then apply fertilizer and irrigate again.